A new USDA Forest Service report was released this month, documenting an unprecedented effort to inventory birds in the western Great Lakes region and analyze changes in bird populations over the past quarter of a century. It found that across a trio of national forests, most birds are doing well in terms of both species diversity and population. The research was part of a large collaborative effort and involved several UW-Green Bay faculty and students. National Science Foundation, NBC Learn and U.S. Patent and Trademark Office explore process behind innovation. A new set of educational videos, released February 17th, 2016, continues an exploration begun three years ago into the creative process that leads to innovation. From 3-D bioprinting that could generate heart tissue to origami-inspired structures built for space exploration, the six new “Science of Innovation” stories highlight how innovation can turn fundamental science and engineering ideas into significant societal and economic impacts. NBC Learn, the educational arm of the NBCUniversal News Group, produced the first set of “Science of Innovation” videos in 2013, in partnership with the National Science Foundation (NSF) and the U.S. Patent and Trademark Office (USPTO). Each video aligns to state and national education standards. Lesson plans and activities will be available soon to help teachers engage students in the classroom and teach key concepts about innovation and STEM. “3-D Bioprinting” — Adam Feinberg of Carnegie Mellon University has created a technique that expands the use of 3-D printing technology and could one day allow researchers to print heart tissue. 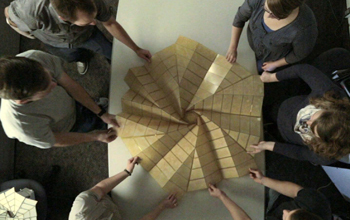 “Origami Structures” — Origami is the ancient Japanese art of paper folding. To engineer Mary Frecker of Pennsylvania State University, it is the future for designing tools that could be used in fields such as medicine and space exploration. “Friction-Stir Welding” — Welding has long been used to join pieces of metal together. At the University of North Texas, Rajiv Mishra is using a form of welding in a new technology that can improve metal’s strength, toughness, and other properties. It could bring new opportunities to the automotive and aircraft industries.”Motion Controller for Virtual Reality” — William Provancher of Tactical Haptics has developed a device that combines the sense of touch with technology. Called the “reactive grip,” it allows the user to experience the virtual world in a whole new way. “Micro-Fabrication for Cochlear Implants” — Angelique Johnson is the CEO of MEMStim, a company innovating how electrode arrays in cochlear implants are manufactured. Using automated micro-fabrication, instead of costly hand-made manufacturing, Johnson is able to lower the cost of production, allowing more people in need of implants to afford them. “Using Viruses to Make Batteries” — While most people see viruses as harmful, MIT’s Angela Belcher sees the future of energy. Belcher uses viruses engineered in her laboratory to form nano-scale wires for tiny batteries that could eventually be used to produce a wide range of electronics at a lower cost. The Adobe Reader DC Version 2015.010.20056 released on January 12, 2016 was identified to blank out form field contents when attaching files. Below is the current workaround as we work on a permanent solution for the latest Adobe Reader DC version. 1. 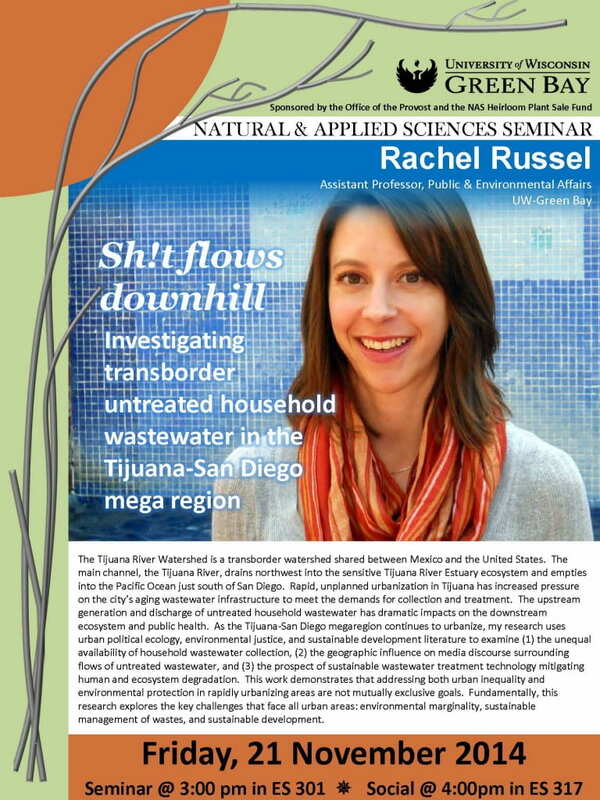 Uninstall Adobe Reader DC. 4. Download installation file and install. 5. Applicant should be able to successfully complete their application without issue. For more information, please visit the Grants.gov Adobe Software Compatibility page. 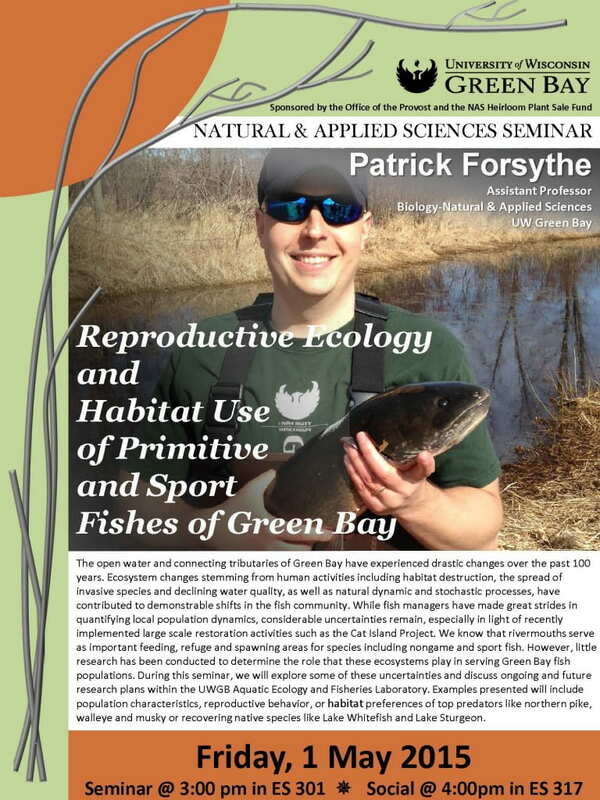 Please join us Friday, May 1st for the next NAS Seminar Series with Assistant Professor of Biology, Patrick Forsythe, of Natural and Applied Sciences here at UW Green Bay, as he presents “Reproductive Ecology and Habitat Use of Primitive and Sport Fishes of Green Bay”. 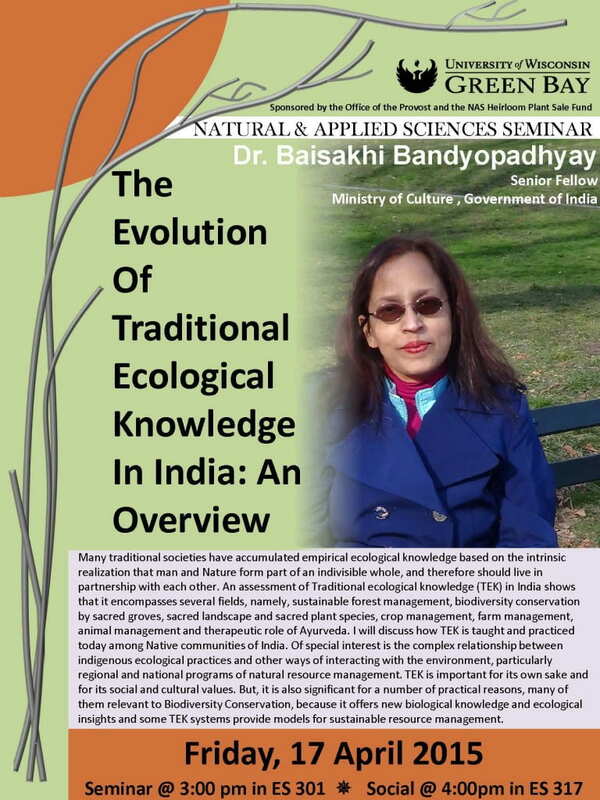 Please join us Friday, April 17th for the next NAS Seminar Series with Dr. Baisakhi Bandyopadhyay, Senior Fellow in the Ministry of Culture of Government of India, as she presents “The Evolution of Traditional Ecological Knowledge in India: An Overview”. 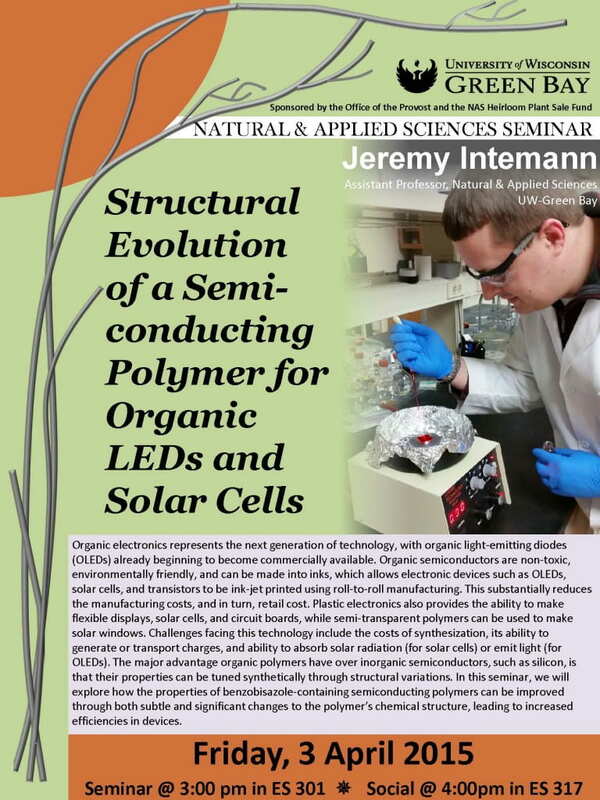 Please join us Friday, April 3rd for the next NAS Seminar Series with Jeremy Intemann, Assistant Professor of Natural & Applied Sciences at UW Green Bay, as he presents “Structural Evolution of a Semi-conducting Polymer for Organic LEDs and Solar Cells”. 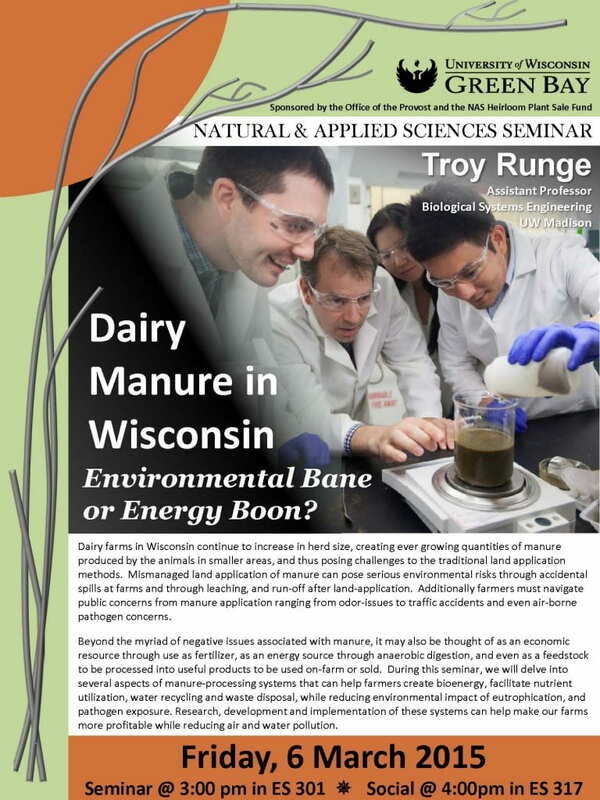 Please join us Friday, March 6th for the next NAS Seminar Series with Troy Runge, Assistant Professor of Biological Systems Engineering at UW Madison, as he presents “Dairy Manure in Wisconsin: Environmental Bane or Energy Boon?”. 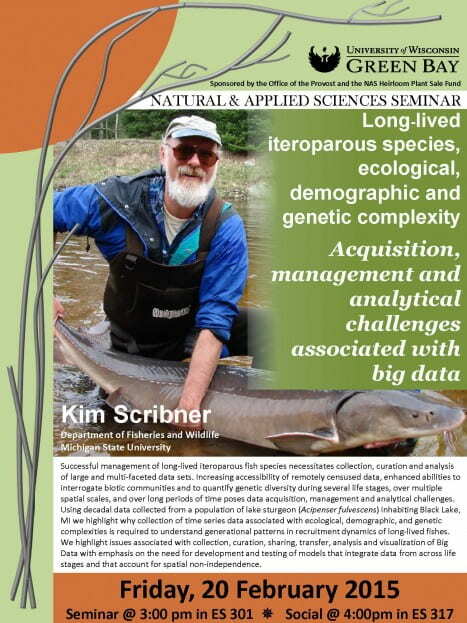 Please join us Friday, February 20th for the next NAS Seminar Series with Kim Scribner, from the Department of Fisheries and Wildlife at Michigan State University, as he presents “Long-lived iteroparous species, ecological, demographic and genetic complexity: Acquisition, management and analytical challenges associated with big data”. 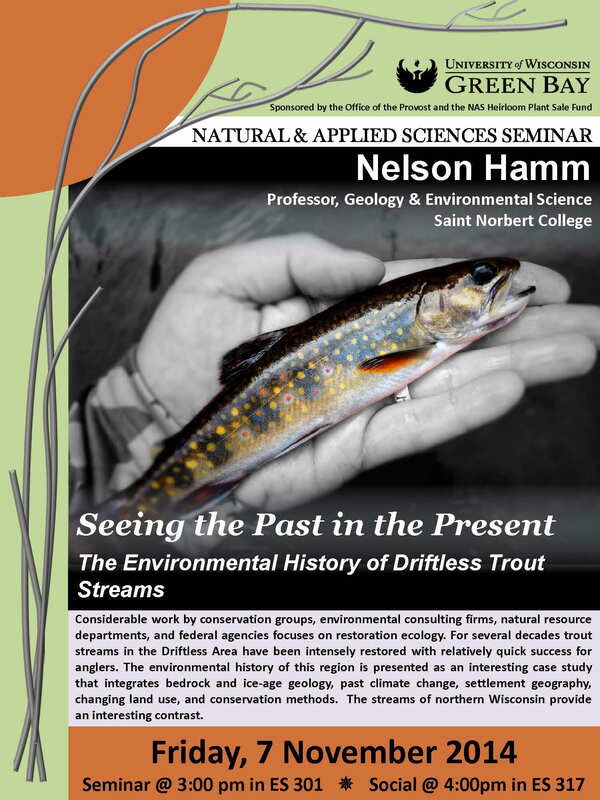 Please join us Friday, November 7th for the next NAS Seminar Series with Nelson Hamm, Professor of Geology & Environmental Science at St. Norbert College, as he presents “Seeing the Past in the Present: The Environmental History of Driftless Trout Streams”.